Is Anonymity Becoming More Valuable Than Fame? I recently spoke on the phone with both author Parmy Olson, and filmmaker Brian Knappenberger. I was quite moved by what they told me. I think it’s impossible to take a perspective because so little is known in these early days of the group’s existence, so I’m attempting to provide the insight I was given so that you may make an informed decision. I ask questions that occurred to me after speaking with Ms. Olson and Mr. Knappenberger. I think these are the kinds of questions that need to be asked right now so the general public may become more informed about what Anonymous stands for. Surely you’ve heard about their recent attack on the folks at Westboro Baptist Church for the church’s intention to picket the funerals of those killed in the blasts during the Boston Marathon. This isn’t the first time they’ve been attacked either. Read on to learn more. 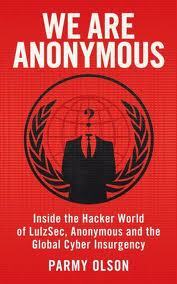 I hope that it will do you good and shed some much needed insight on Anonymous. Picture the early days of the Internet as pre-conquest America. Its vast, undiscovered frontiers are simultaneously awe-inspiring and daunting. People are finding ways to get by. They are organized and flourishing. They live in balance with their surrounding ecosystems and have an unyielding respect for that which sustains them. If this vision of a virginal, pristine land is the Internet, then I posit that hackers are the natives. Their survival skills are rooted in a deep understanding of and connection to the ecosystems which sustain them. However, like any collective, their cultural norms can be varied and difficult to interpret. We see in them only what our perceptions allow us to. 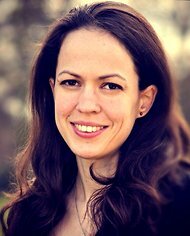 In her book We Are Anonymous, author Parmy Olson is at once journalist, anthropologist and documentarian, recording and recounting primary interviews with members of the hacker collective responsible for several high-profile online attacks over the last few years. Beginning in 2003 and recently working to ban an alleged pedofile from Twitter, Anonymous has targeted the U.S. Department of Justice, the Chicago Police, India’s Supreme Court and Congress, the Church of Scientology, PayPal, MasterCard, Visa, Tunisia’s Prime Minister, Westboro Baptist Church, Sony, Fox’s The X Factor, PBS, Britain’s Serious Organised Crime Agency (SOCA), British tabloid The Sun, the CIA, and oil companies Shell, Exxon Mobil and BP. With such an impressive list of successful attacks to its name, it’s no wonder Anonymous made it to the top of TIME’s Top 100 People public poll. But who comprises Anonymous? How is this collective structured? And how were some of the hackers caught? Olson tracks the group’s rise and fall by delving into the online and offline lives of the major players and underlings who fill out the ranks. She pinpoints its genesis on 4chan image boards and traces its many splinter groups like AntiSec and LulzSec. “I’ve always been fascinated by secret cultures and societies, underground groups of people, parts of our civilization that are not spoken of that much or understood that well, but can be a driving force in things that happen in our lives,” Olson explains to me. Olson highlights one of the shining stars of Anonymous and LulzSec, Jake Davis. Before his arrest and unmasking, he achieved almost mythical status. Using the screen name Topiary, his clout gave him the platform to assert his beliefs about online ethics, digital culture and what the Internet should be — often in front of thousands of adoring online fans. Through personal interactions with Davis, Olson learned that his coding and hacking skills weren’t as good as some of the other notable members. Instead, it was his writing prowess, raw wit and natural ability to create narrative propaganda that catapulted him into a leadership role. From the get-go, the group fully grasped the importance and power of well-crafted communication. They saw it as integral to recruitment and the dissemination of their ideals and plans. Davis and the other hackers associated with LulzSec instead felt more comfortable roaming the primitive lands of the Internet on image boards like /b/ on 4chan and the vast array of Internet Relay Chat (IRC) networks. But, even escapades on the Internet cannot escape the adage, “what goes up, must come down.” Davis eluded American and European authorities for months, but was finally caught in his home in the Shetland Islands of Scotland. Details are still emerging about what ultimately led to his capture. It could have been the culmination of a few tiny mistakes or a former friend’s betrayal. It could have been something as seemingly harmless as allowing his real name to appear briefly in an IRC chat, or a connection error with one of his many VPNs (virtual private networks) — all mistakes that would allow authorities to pinpoint his location. Rumors have also surfaced that a past friend may have recognized his voice during his notorious video prank of the Westboro Baptist Church, or that a former hacker colleague-turned-informant offered Davis up to lessen his own punishment. “Among the things Jake noticed during his interviews with detectives was that the police seemed to see Anonymous as an organized criminal group. When the detectives questioned Jake, they seemed to want answers that fit that point of view. Jake tried to explain that Anonymous was not a group, was not organized, and did not have a structure. It was more of a culture or an idea than a group,” Olson writes of Davis’ experiences once arrested. Since Olson herself admits that the information given to her during interviews may be suspect, it’s important to corroborate the ideas disseminated from members of Anoymous to gain a better picture of their intentions and what they stand for. Security strategist and researcher Joshua Corman essentially agrees with Davis’s assertion. Some who follow Anonymous are concerned that the correct information isn’t reaching the public. 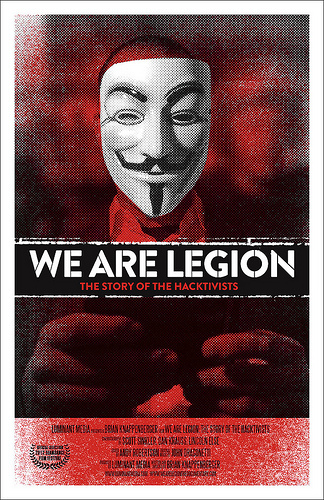 Filmmaker Brian Knappenberger is trying to change this in his documentary We Are Legion. During a recent hiking trip, I reflected on Olson’s book, and it occurred to me that my urban and digital survival skills are much better honed than my wilderness survival skills. A person living in New York City need only venture into the great outdoors overnight to remember the power of unbridled nature. Upon realizing the woods could gobble me up without hesitation, I felt a burst of deep respect and reverence for the unknown, and for those who thrive in nature’s organized chaos. Maybe that same sense of reverence should be offered to hackers, or should I say, digital natives? This entry was posted in Digital Strategy, The Freshness and tagged anonymous, brian knappenberger, mashable, parmy olson, we are legion by Brandon. Bookmark the permalink.